A last-minute change by the Oregon Senate on Friday to a proposed increase in the state’s lodging tax left Lane County lawmakers fuming. The change, adopted because of pressure from Portland area Democratic senators, would erode further the size of the tax increase, meaning a smaller pot of new revenue for tourism-­related ventures across the state. It also could make it more difficult for the tax increase to cover the full $25 million subsidy that will be requested for the 2021 World Track and Field Championships in Eugene. Not getting the lodging money would be a big challenge to TrackTown’s goal of bringing 2,000 athletes from 214 countries to Eugene for a nine-day event in August 2021, Lananna said. But coming up empty-handed in the February session would not stop TrackTown, he said. Track Town is not backing off its contention that it eventually needs $40 million in public funding to stage the event. Backed by the formidable political power trio of Nike, Phil Knight and the University of Oregon, it has plenty of clout in Salem. … It’s a lucrative arrangement. Even at part-time, Lananna gets paid $440,000 a year, including some deferred compensation, by the university. Track Town and related entities paid him another $334,300 annually, according to the non-profit’s tax return. On top of that, Nike pays Lananna $30,000 a year as part of a long-term consulting contract. Supportive lawmakers downplayed the track event funding during Tuesday’s the floor debate, arguing instead that the added tax revenue will give Travel Oregon the ability to promote tourism and will dole out more money to regional tourism agencies around the state. “Investment in tourism pays off big time,” said Rep. Nancy Nathanson, a Eugene Democrat and key backer of the bill. 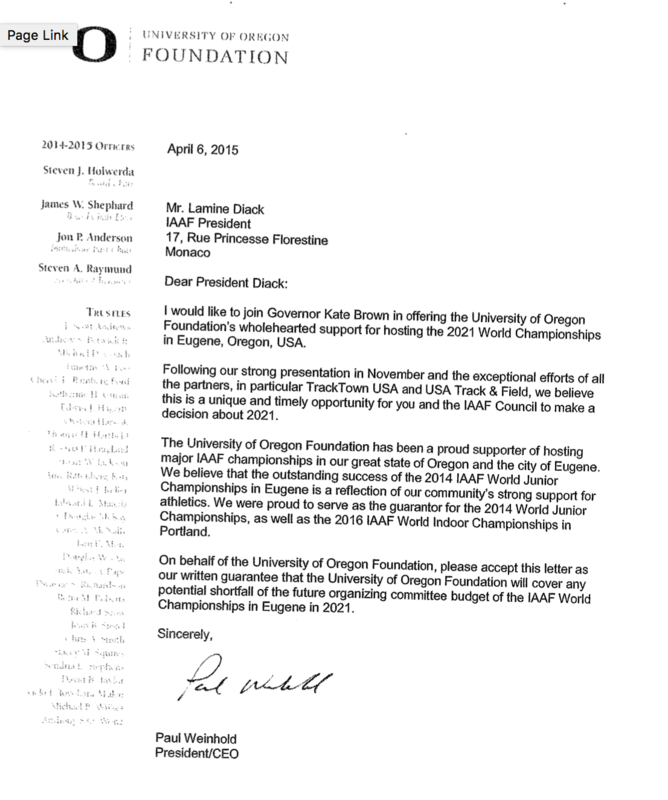 The University of Oregon, Office of Public Records has received your public records request for “…records, including but not limited to emails, letters and reports, received by the University from TrackTown USA, or generated by the University, regarding holding the International Association of Athletics Federation world championships in Eugene… from September 25, 2014 to the present.” The office is now providing an estimate to respond to your request. For the purpose of efficiency, the office has taken “the University” to mean the offices involved in similar past requests. As such, the office created the below estimate using time for the Board of Trustees, Athletics, the Office of the President, and State and Community Affairs. If you would like the office to contact additional departments in response to this request please advise the office at your nearest convenience and we will revise the estimate. The office estimates the actual cost of responding to your request to be $645.02. Upon receipt of a check made payable to the University of Oregon in this amount, the office will proceed to locate, copy, and provide the records you have requested that are not exempt from disclosure. Your check may be sent to the attention of Office of Public Records, 6207 University of Oregon, Eugene, OR 97403-6207. The university has received your request for a fee waiver for these records. The decision to waive or reduce fees is discretionary with the public body. After considering your request, the possible public interest in these particular records, and the length of time required producing and redacting these records, the office does not consider that the totality of the circumstances presented in this instance meets the standard for a fee waiver. 2/21/2016: It seems likely to pass, given Saul Hubbard’s report in the RG here. 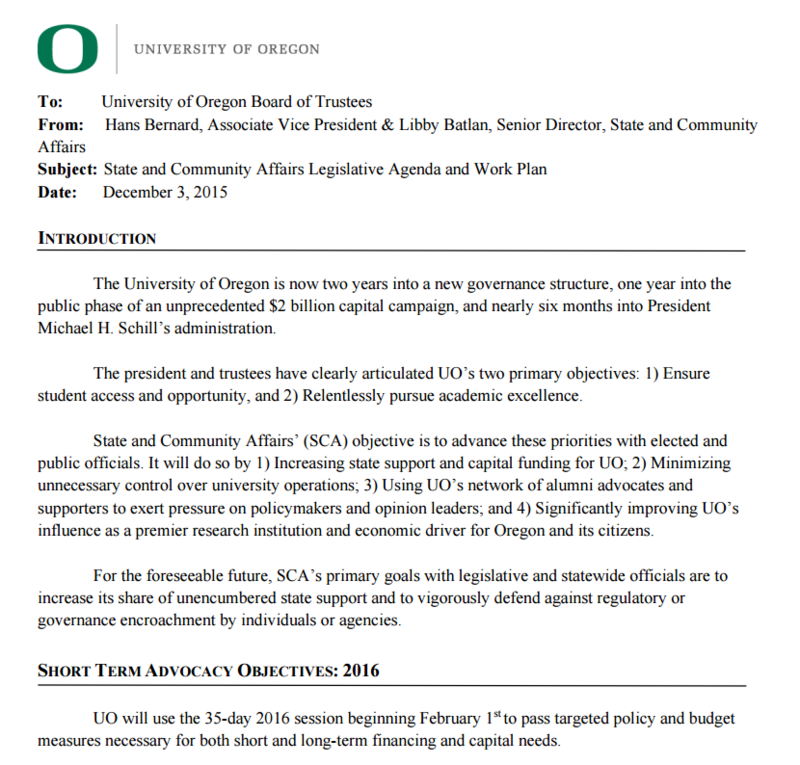 Makes you wonder what UO’s expensive government lobbying operation could do for the academic side, if they tried. But things have changed. 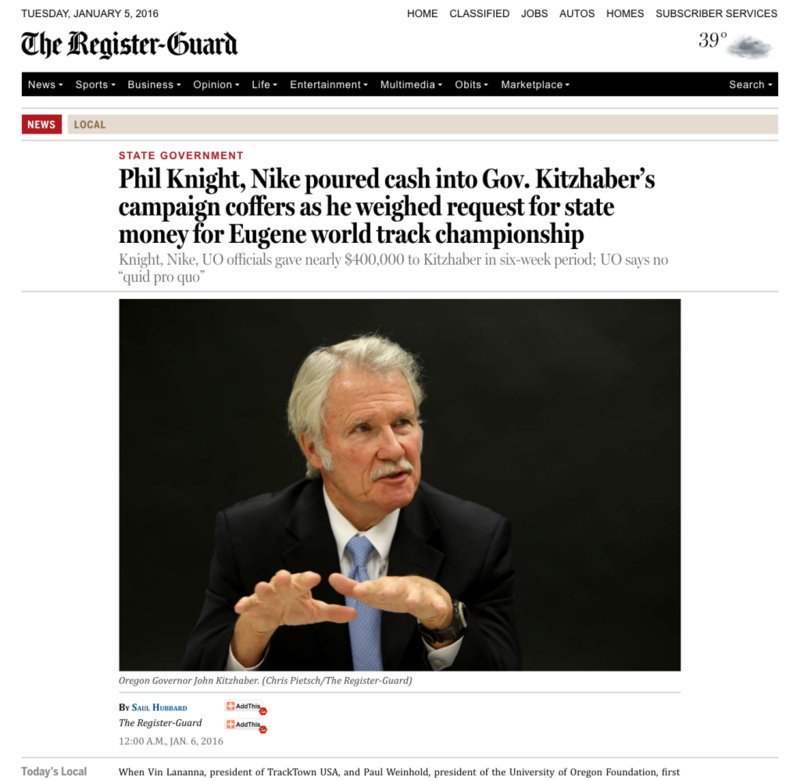 It’s become harder to ignore the extent of the IAAF’s corruption, reporters have started to ask questions about why a university foundation would guarantee losses for a track meet, the suspicious timing of campaign gifts to former Gov Kitzhaber, and the potential conflicts of interests for Lananna, who is paid $440K by UO, $335K by Track Town, $30K by Nike, and has now registered a corporation in Delaware, to develop a for-profit professional track league. Not to mention the possibility of Swedish military action against Eugene if the bidding isn’t reopened. “The idea surfaced frankly out of Salem (the state capital) that Salem and our legislature might be able to provide some support for Hayward,” Weinhold said. 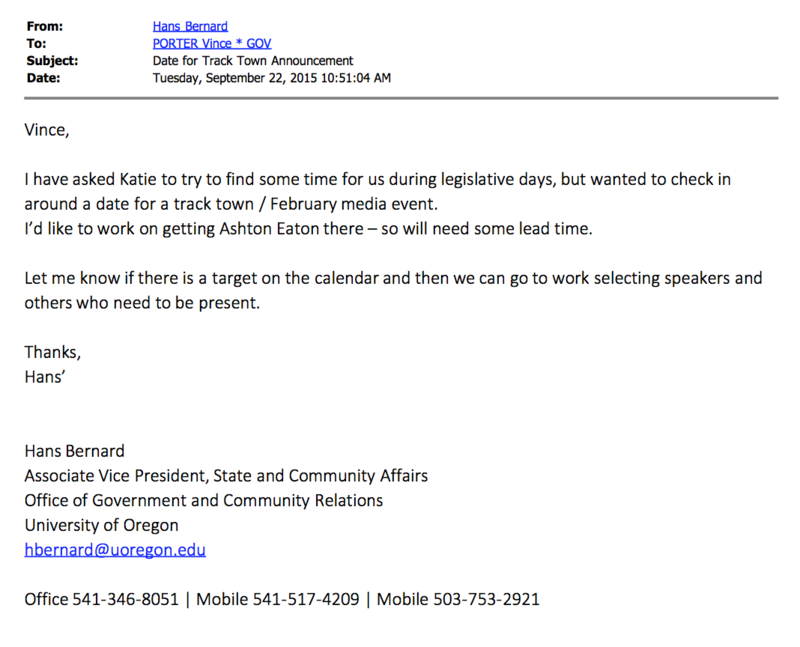 The University of Oregon and the UO Foundation are missing from the list of those testifying on Nathanson’s scaled back $25M stealth subsidy legislation. Instead it’s packed with ex-olympians, Lananna’s Track Town, the USOC, and others with sentimental ties or likely to get a cut of the state subsidies. (Former Foundation board chair Jon Anderson provides an endorsement, but pointedly does not mention any connection to the Foundation.) Testimony on the hotel tax increase will continue Monday, the legislative info is here. “This is not about a single event. It’s about improving the tourism sector of our economy,” said Rep. Nancy Nathanson, the Eugene Democrat who is the key backer of HB 4146. 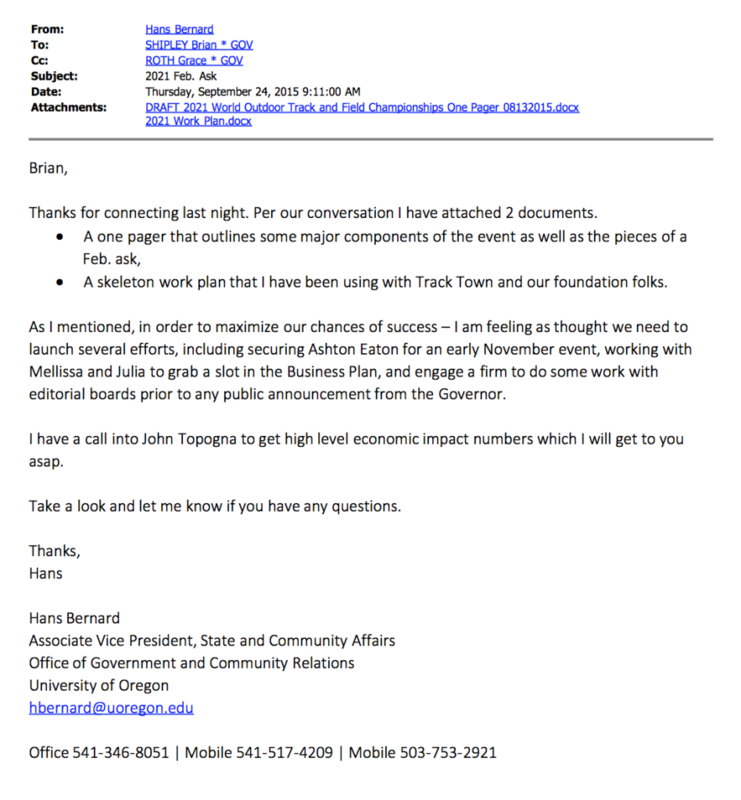 Still, the subsidy for nonprofit TrackTown was at the heart of Friday’s discussion. The International Association of Athletics Federations last year awarded TrackTown the 2021 IAAF track and field championships for Eugene. The event will cost far more to stage than it can bring in in ticket and other marketplace revenue and corporate donations, so TrackTown President Vin Lananna is seeking government subsidies. But obviously they’ve been busy, tearing up Vin Lananna’s plan to have Seb Coe and Ashton Eaton come and make a big show of asking the legislature for $40M. Now they’ve come back with a stealth plan for only $25M – and they’ve done it without mentioning the IAAF or Track Town once. You can follow the legislation and testimony on OLIS, here: https://olis.leg.state.or.us/liz/2016R1/Measures/Overview/HB4146. 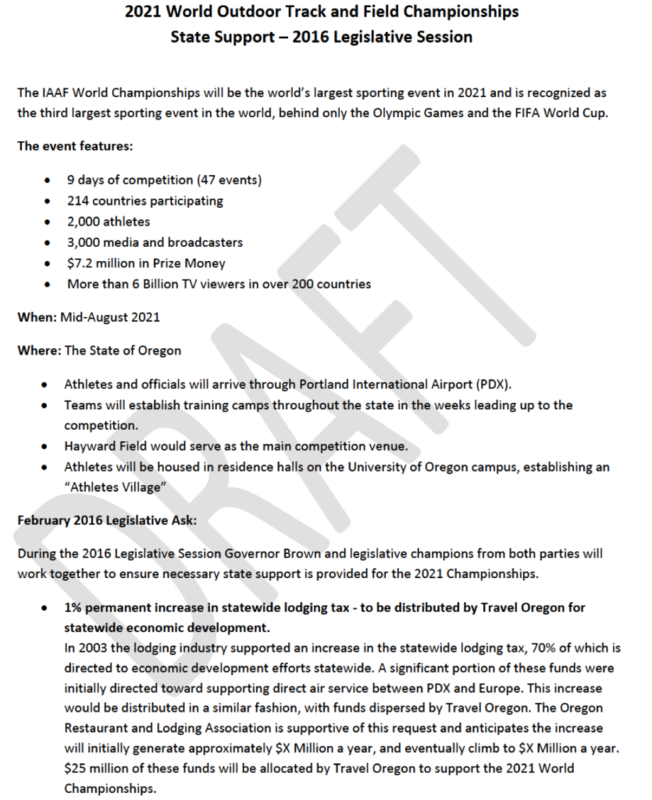 SALEM — Travel Oregon, the state’s small tourism marketing agency best known for its scenic TV and online ads, might soon be responsible for making an unprecedented decision on a $25 million state subsidy for the 2021 world track and field championships in Eugene. … HB 4146 would double Travel Oregon’s annual budget, adding about $17 million a year in new revenues, with virtually no legislative direction as to how the new funds should be spent — which is highly unusual for a targeted tax increase. 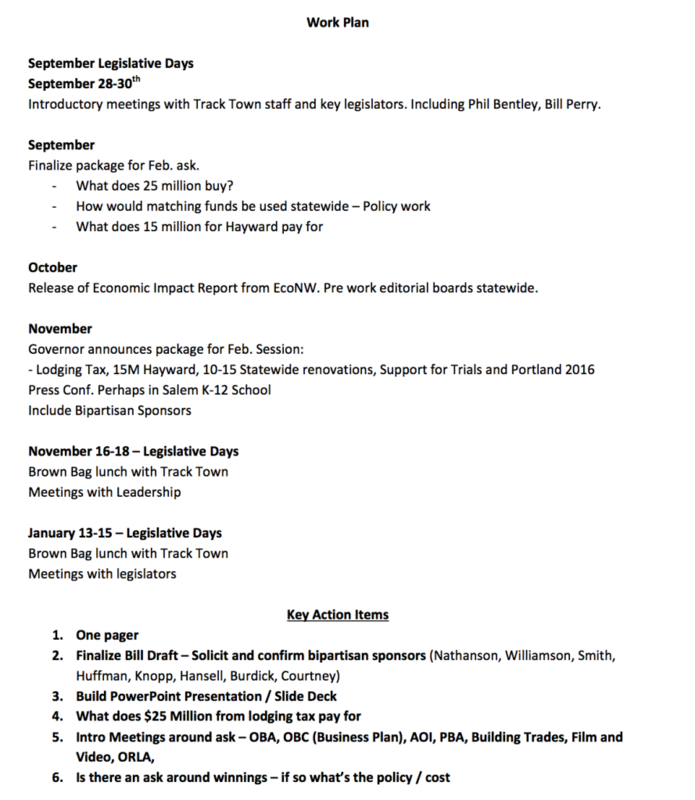 Travel Oregon’s board has never considered a funding request like TrackTown’s. The board has typically allocated about six matching grants a year to other agencies for tourism marketing projects. Until this year, those grants were capped at a maximum of $20,000. The board has received stand-alone requests for costlier “sponsorship” opportunities in the past. But it has funded only one large one since 2003: a five-year, $5 million advertising and sales campaign in Germany to help airline Lufthansa fill its new nonstop flights to Portland. And what return did Oregon get from that $5M investment? $0. Lufthansa ended the flights in 2009 and hasn’t been back to PDX since. Not a good omen. “[Redacted]” with the state for the track meet would also look bad given the planned big tuition increase, and the big financial hole in the academic program. Hard to make the connection for how this funding advances the stated “two primary objectives” of access to education and academic excellence. Took a sharp turn along the way. It likely won’t happen but I’d like see this all get passed and have the ongoing investigation find out corruption was involved and watch the rug get pulled out from under Lanana and his cronies by having the games go to another location. This whole thing does not pass the smell test with Lanana having his fingers in all of these pies and all to his benefit of course. If you really care about this matter, please contact Senator Prozanski. Why not dedicate the hotel taxes on lodging the homeless? All the state’s big political leaders have acknowledged we’re in a housing “crisis.” So why isn’t solving this humanitarian crisis a bigger priority than paying for a big track party for Nike? The $25 million would go a long way toward subsidized housing, shelters etc. Reducing the population of people sleeping and begging at tourist attractions would also provide a big tourism boost. 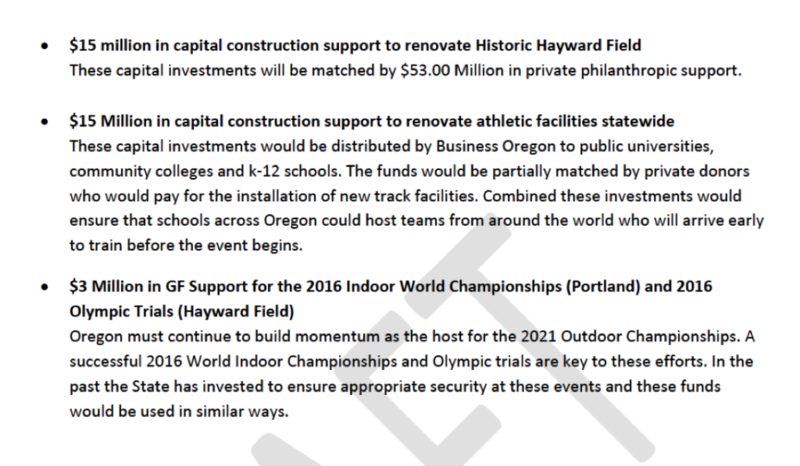 In contrast the big track event will be walled off behind a security cordon with housing and food and most other expenditures internal and little benefit to Oregon businesses. That’s what happened with big track events in the past where restaurants just a block away staffed up but saw a drop in business as locals avoided the congestion. The same will happen with this big event. Thousands of tourists won’t come to Oregon to see the state and spend money in small businesses because all the hotels are full of track people who will spend all their money inside Nike’s security walls. There’s a huge opportunity cost here that’s ignored by Nike’s economic analysis of the event.